Become one of the world's earliest Swift developers with this introductory course on Apple’s new programming language. Swift is a multi-paradigm programming language developed by Apple for use with iOS and OS X. Designed to replace Objective C, work began on Swift in 2010 and the first mobile app was debuted in June 2014 at the Worldwide Developers Conference. Despite its goal of replacing Objective C, Swift is capable of working alongside the more dated Objective C language while using the Cocoa and Cocoa Touch frameworks. Swift is built with the LLVM compiler included in Xcode 6 beta, and uses the Objective-C runtime, allowing Objective-C, Objective-C++ and Swift code to run within a single program. During it’s debut, Swift was described as “Objective C without the C” by Apple’s VP of Software Engineering Craig Federighi. Through 68 video lectures and 2.5 hours of content, you will be lead through setting up Swift locally, the basics of the language, how it compares to other common languages (including Objective C), and how to get started on new projects. The course is designed to provide a comprehensive introduction to Swift, so that you can begin experimenting right away. Upon completion, you will understand the foundations of Swift code and will be able to develop custom applications. You will also get experience working with Xcode's new .playground file. By enrolling in this course you will be months ahead of other developers attempting learn the new Swift programming language by navigating Apple's 500-page instructional document. Course material is regularly refreshed to include all of the newest updates and information, and since you’re granted lifetime access upon registering, you can rely on this course to keep your Swift skills on the cutting edge. 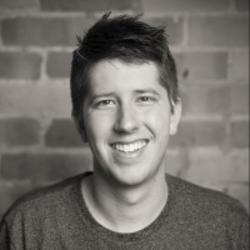 I'm Nick Walter, an iOS developer that has been focused on mobile app design and creation for over 3 years. My involvement in the iOS community started off with a bang, and in 2013 I was one of 25 students worldwide to be invited to Apple's "Cocoa Camp." Within my community, I am also co-president of an Apple developer group called "Cocoa Heads." I've always had an itch to make things, but growing up in a small town I had limited access to programming resources. This frustration drove my early interest in online education. After experimenting with various companies, learning styles, and teaching processes, I've adopted the best strategies and used them in my courses. My experience as an online student has directly influenced my teaching style, and I am now proud to help students all over the world with their online learning goals. Since the announcement of the new Swift programming language by Apple, I have buried myself in the Apple documentation and any online resource that is available. In my first Swift course, I provide students with a detailed explanation of the topics and skills needed to learn Swift, an overview of the basic features of the new language, and get you started to begin building your first products. Prior to teaching the internet's first course on Swift, I have created 5 iOS apps from scratch that are currently live in the App Store and being used by thousands of users worldwide. Using my experience launching my own apps, I'll walk you through the shortcuts that can save you time and frustration from having to teach yourself.